We are offering our customers 25% off all Lawn Fawn Fall & Winter Pre-Orders. This sale has been extended until Friday, July 29th at 12 pm EST (NOON) so order today to take advantage of this amazing deal. These stamps are so adorable and the cards that can be made with them are just as cute. Stop by the store in late August to see for yourself but don't wait, order today, this is the lowest sale price that these will be offered this year. These five cards feature Happy Howloween Stamps & Lawn Cuts, Stitched Tree Borders Lawn Cuts, Everyday Pop-Ups Lawn Cuts, Cheery Christmas Stamps & Lawn Cuts, Big Winter Scripty Words Stamps & Lawn Cuts, Jump for Joy Stamps & Lawn Cuts, Leafy Tree Backdrop: Portrait, Winter Unicorn Stamps & Lawn Cuts, Put a Bow on It Lawn Cuts, Scalloped Treat Box Lawn Cuts, Frosty Fairy Friends Stamps & Lawn Cuts, and Stitched Hillside Pop-Up Lawn Cuts. 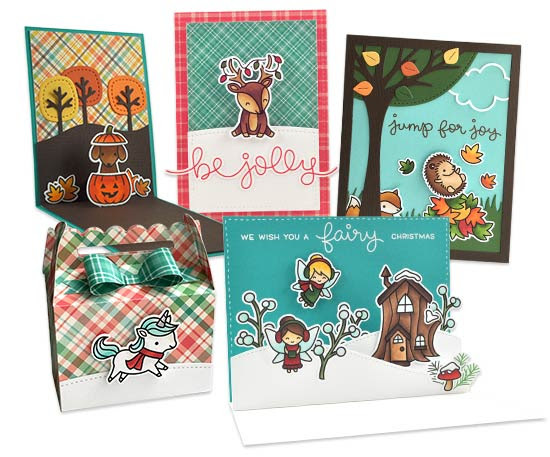 There are also a few exciting new cardstock patterns and inks to complete the Fall & Winter line up. And of course these are in addition to all of the other great stamps, dies, papers, ink and more that they have made over the last six and a half years. Check out our selection of Lawn Fawn Stamps & Dies here... we are still waiting to get these in store since this is a new supplier of ours but we are very excited to get these beautiful items. Order yours today. As always we want to thank you for shopping with us and supporting our small Canadian Family Owned Business.